Is It Bad to Just Drink Water If You're on Diet? Your body must be properly hydrated, whether or not you are on a diet. Drinking water is the simplest way to increase your hydration, although you can drink other liquids such as juice or soft drinks. Many beverages contain calories that sabotage dieting efforts, but water is naturally calorie free and meets all your hydration needs. Sticking to water rather than other beverages during a diet has many benefits. Replacing sugary drinks with water helps you lose weight more quickly because you cut out a lot of calories. Water also helps you feel full, so you eat less if you drink some about 20 or 30 minutes before eating, according to Wake Forest University Baptist Medical Center nutritionist Mara Vitolins. Drink water if you have an urge to snack, as it might fill you up without eating anything. Water hydrates you, but many beverages are actually dehydrating. Soft drinks with caffeine and other caffeinated beverages, such as coffee and hot and iced tea, are diuretics, Vitolins warns, so you potentially dehydrate yourself through increased urination. Add a slice of fruit, such as lemon, lime or orange, to plain water if you find yourself missing other drinks. You get liquid from other sources, even if you cut all drinks but water out of your diet. For example, fruits and vegetables, such as tomatoes and melon, contain a significant amount of water. Include foods with a lot of liquid in your diet if you want to get hydration from a variety of sources, even though you are only drinking water. Good low-calorie options include broth-based soups, pudding and no-added-sugar yogurt. Daily water requirements vary from person to person, but the Mayo Clinic recommends drinking eight or nine cups or eight 8 oz. bottles per day. You must replace the water lost through sweating, urination and normal body functioning, so drink more if your diet program includes heavy exercise that makes you sweat excessively. You are drinking enough water if your urine is colorless or slightly yellow, as deeply colored urine is a sign of dehydration. 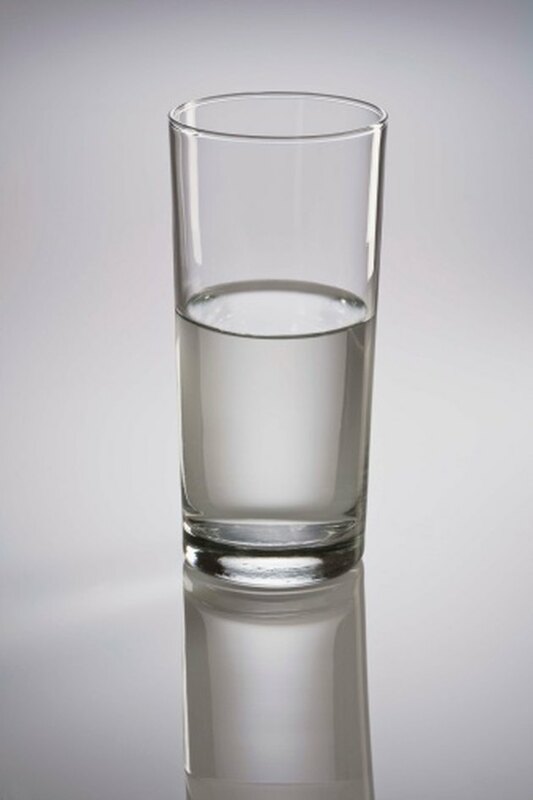 You can harm yourself if you drink too much water, the Mayo Clinic warns. Excessive water intake causes a condition called hyponatremia. Your body cannot excrete the extra water quickly enough, so your blood's mineral content gets diluted, and sodium levels drop. This condition is rare among people who eat a healthy diet and is seen most commonly in marathon runners and other athletes in endurance competitions. Does Drinking Powdered Drinks Count as Drinking Water? What Liquids Can Best Help You Urinate? Can You Drink Juice Instead of Water? How Do You Make Lemon Water to Lose Weight?